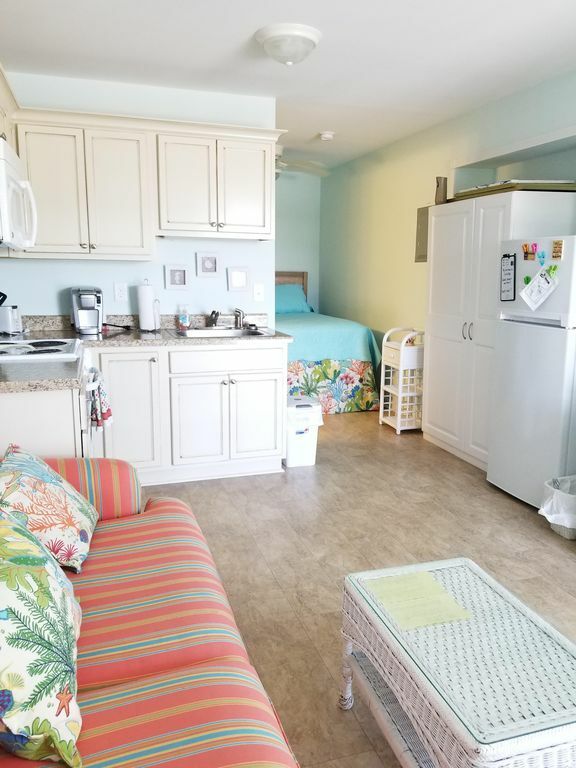 This beautifully decorated unit is located just a few steps from the ocean for you to lay in the sun, take sunset walks, pick up seashells, build sandcastles with the kids or sit in the gazebo and have your morning coffee while watching the dolphins frolic and play. Relax inside the fully equipped unit that provides a queen bed and a couch that can be made into a single bed by removing the back cushions. Unit has an oven, refrigerator, microwave, Keurig coffee maker, toaster, crock pot, dishes, glassware and named brand cookware for the chef. Enjoy our excellent restaurants up and down the Crystal Coast. Most of all..... come have fun and RELAX! No more than two cars please. Park on the backside of parking lot. We strive to leave the parking spots directly in front of each unit for the elderly and disabled. 4 towels, 4 washcloths, 1 foot towel, 1 hand towel, 1 kitchen towel and dish cloth. There are area fitness gyms. You can google fitness gyms to locate several. There is not a dining table in unit. There are two fold out "TV Trays" designed for placing your food on. Kayak and Canoing available. This information is included in your guest book. Bikes can be rented. This information is included in guest book. There are public boat ramps in the area but boats trailers are not allowed to be parked in Ocean sands parking lot. There are several beach shops and surf shops located on the island. Area gold available. This information will be in your guest book. Relaxing, rejuvenating, perfect spring break! Cute, cozy, comfy... with everything I needed! After a day of sight-seeing it was so nice to come 'home' with all of its comforts (internet, tv, comfy couch). Everything is so close: the aquarium, the fort, the ice cream shop! And the beach... just around the other side of the building. I could stroll it all day long. Found some cool shells and polished rocks for souvenirs. Hurricane Florence definitely did a number on the island... affected so many things. But! Repairs are being made to shops, restaurants, and the fort; the beach is still perfectly beachy, and the ocean is the best place to re-center yourself. The unit has everything you need and then some! Be sure to check the spice cabinet before shopping, there are plenty for whatever you're cooking. It is a little place, which is perfect for little me, heh, except the bed is really high! I'll be back! Thank you for such a nice review. We do look forward to having you back again soon. My only complaint is that vacation couldn't have lasted longer, I didn't want to return to the real world. I loved everything about this place. Felt like I had the beach all to myself. The room was perfect! We are truly sorry you didn't enjoy your stay. We deal with mildew and moisture issues because we are located directly on the beach. Your unit did not have any mildew. The low pressure system with impending hurricane caused a lot of the moisture issues to worsen hence your allergy response. Unfortunately, there are some things we can't control. We do apologize again and hope you get better soon. Stay at the condo with my fiancé for my birthday. It was just big enough for the two of us, close enough to restaurants and shops but far enough to give us peace and quiet we wanted. The power went out for a little while when we first got there but the complex security was on it right away and power was restore within a half hour. All in all would definitely stay here again! This was a great place for a quick getaway for my husband and myself. Small but very cozy! A Guest book is provided in the unit with listing information for local attractions, restaurants, gyms, fun for kids, theaters and much more!